Many people are surprised to learn how prevalent palm oil ingredients are in breakfast cereal. In fact, it continues to be extremely difficult to find ready-to-eat cereals without palm oil ingredients. Most cereals are fortified with vitamins. An easy way to tell if palm oil is in your cereal is to look at how much Vitamin A is in it. If it’s 10% or greater, it most often contains Vitamin A Palmitate which is likely made with palm oil. There are other palm oil ingredients in cereal to watch for which we explain below. We emailed each of these cereal companies to confirm their cereals are palm oil free. We continue to update this list as we hear back from them. Also, we continue to add to this list as we learn of additional cereal brands and products. Check back regularly. After researching cereals in several grocery stores, including industry-leading cereals and many healthier brands, we’ve found these cereals without palm oil. Thanks to Kashi who reviewed their processing aids and double-checked with all of their suppliers, including the ones who provide their natural flavors. They’ve confirmed these Kashi products are 100% free from palm oil derivatives. It’s hard to find palm oil free versions of granola because companies add Glycerin, Mixed Tocopherols, and Tocopherols. According to Erin Baker’s, all of their granola is palm oil free. It’s also Non-GMO Project Certified and gluten free. 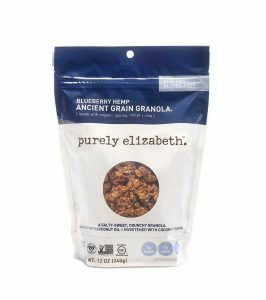 We are happy to have confirmed with the brand Purely Elizabeth that they offer a wide variety of granola without palm oil. On a personal note, my son gets very sick from anything with palm oil. He loves granola for breakfast and for a snack. However, we weren’t able to find granola without palm oil until we saw Purely Elizabeth at Target. We were thrilled! They use real ingredients you can recognize and pronounce. So far, we’ve tried Purely Elizabeth’s Blueberry Hemp Ancient Grain Granola. We bought it several times from Target and other grocers. It’s non-GMO and gluten-free and also includes all of these organic ingredients: oats, coconut sugar, raw virgin coconut oil, sunflower seeds, puffed amaranth, hemp seeds, millet flakes, quinoa flakes, chia seeds, and cinnamon. It tastes amazing! It has more clusters and clumps than mainstream brands which makes it even better. We love it and look forward to trying their other flavors. We are updating this to include oatmeal, though our original intent was to focus on ready-to-eat cereals. However, we learned about two companies who had their single-serving size oats certified Palm Oil Free by the International Palm Oil Free Certification Programme. Purely Elizabeth also offers a variety of single-serving sized cups and regular-sized flavored oatmeal without palm oil. You may be avoiding everything with the word “palm” in it. And that’s a great start. However, when it’s disguised as other names, it gets trickier. You might not realize there are many other names for palm oil in cereal and other foods. Usually, most types of fortified cereals will contain palm oil ingredients. Most contain Vitamin A Palmitate, which is a synthetic vitamin manufacturers make with palm oil. Fortified cereals sometimes contain Vitamin E in the form of Tocopherols. Note that Tocopherols and Mixed Tocopherols are also often added to cereals and other products to preserve freshness. Once you know what to look for in cereals, it will be a lot easier to find them without palm oil. If you see a cereal with DV of 10% or more of Vitamin A, most likely it will have Vitamin A Palmitate. This synthetic vitamin contains palm oil. You will find this palm oil derivative in most of your Kellogg’s and General Mills cereals. In Post and Quaker, you will see them less often as many of their cereals aren’t fortified with Vitamin A. Many Kellogg’s, General Mills, and Post cereals will state palm oil or palm kernel oil right on the ingredients. Complex flavors such as chocolate, peanut butter, Oreo, etc. often contain palm oil. Also, watch out for cereals that are coated, waxy or greasy feeling. All of these will have these ingredients listed with the actual words “palm,” which makes it easier. In my quest to find cereals without palm oil, I made many mistakes. Very unfortunately, my son paid the price in terms of getting sick from the palm oil we didn’t know was in the cereals. I bought several varieties of palm-free-seeming cereals, and each one made him sick. I didn’t know why until I learned tocopherols are often made from palm oil, especially when used in lower cost products. Tocopherols can be added as a form of Vitamin E and/or to preserve freshness in cereals and other foods. The symptoms my son had after eating cereals with tocopherols were different from when he consumed the other palm oil ingredients. While cereals and foods with palm oil gave him immediate congestion and throat clearing, etc., cereals with tocopherols made him completely exhausted and lethargic and caused him to have a few hives. I’ve contacted many companies asking about their tocopherols. Many cereal manufacturers use palm oil to make tocopherols. We do not take the chance and avoid them completely. You have to watch out for glycerin in cereals as well. It’s common in granola. Some healthier brands, including Purely Elizabeth as mentioned above, are using better-quality ingredients. As you may know, palm oil ingredients go by hundreds of names. Print out this extensive list and keep it with you as a resource if you are trying to avoid palm oil. Carry it with you, and before buying any new products — foods and self-care products — reference it. It’s a way to ensure you buy palm-free products. After doing this a few times, you will know what to look for and the products and brands to buy. It’s so important to support these companies. Please especially support these specific products who don’t use palm oil ingredients in their cereals. Be sure to read the labels as companies change ingredients in their products. As palm oil becomes even more prevalent in products, hopefully there will be more information to help people find products without it. Cereal is a staple in our house. It’s been a challenge to find cereals without palm oil. We are always on the lookout for more cereals. We will continue to buy palm free cereal and products. If we are not certain they are, we don’t buy them. Please use this list. We compiled it to make it easier to find cereals without palm oil. 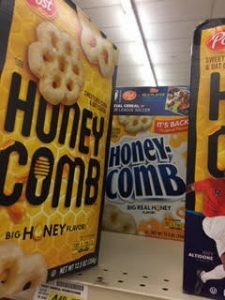 Both versions of Honey Comb on the shelf. The “It’s back” box in the back is now what Honey Comb looks like. It now contains Vitamin A Palmitate, a palm oil derivative. We will be brand-loyal to these cereals and applaud them for using palm-free alternatives. 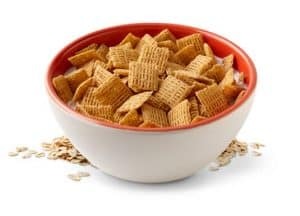 To the best of our knowledge, after cross-referencing their ingredients against hundreds of names of palm oil derivatives and checking with companies, these cereals do not have palm oil ingredients. Please note, content on this site is for reference purposes only. We do not warrant that the ingredient, sourcing, allergen, and product information is accurate or complete. Our information comes from product manufacturers. Product formulas, ingredients, and labels change. Please read labels and do your due diligence. We continue to update this regularly. We also remove products when companies change their ingredients as in the case of Honey Comb cereal. Honey Comb from Post used to be palm free but in mid-2018 they began to fortify it with Vitamin A Palmitate. The version on the shelf prior to this change (the left cereal box in yellow) did not include palm oil derivatives and was one of the few “sugar cereals” my son could eat. We no longer buy this cereal but bought the remaining boxes from three stores. If you know of or find cereals without palm oil, please include them in the Comments so we can support these brands.